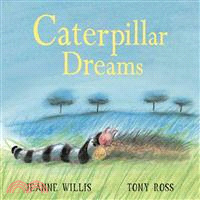 Two little caterpillars dream about the butterflies that they will be when they grow up, and how they will play in the sun together, but after their change they find that one of them has not turned out as they had expected. Jeanne Willis is the author of Never Too Little to Love. She and Tony Ross are the author–illustrator team of numerous books, including Daft Bat, I Hate School, I Want to Be a Cowgirl, Dr. Xargle's Book of Earthlets, Susan Laughs, and the Smarties Book Prize–winner Tadpole's Promise.